It’s all up to you. OTR can still win this challenge but only if you make sure your contacts vote. 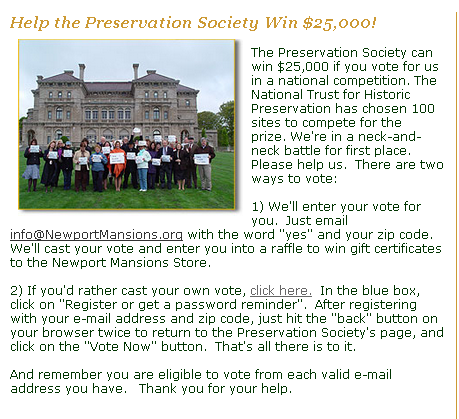 In a stunning turn of events, the Friends of Dreamland Theatre from Little Rock, Arkansas have taken a substantial lead into first place with just hours left in the National Trust for Historic Preservation’s This Place Matters Community Challenge. Without being accusatory, I am personally suspicious of any vote totals which rise at a clip of several dozen per minute in the wee hours of the morning. Fortunately, the terms of the contest requires registration. This means that if someone was able to vote with the address fakeemail@thisemailisfake.com, it will be flagged as “bad” in our system and discounted. If someone voted with two separate (but valid) email addresses (i.e. your personal and work emails), it will count as two separate votes. And yet, I’ve been told (and Google has confirmed) that there are ways to turn one gmail address into an infinite number by appending a “a plus (“+”) sign and any combination of words or numbers after your email address. For example, if your name was hikingfan@gmail.com, you could send mail to hikingfan+friends@gmail.com or hikingfan+mailinglists@gmail.com“. I’m not convinced this wouldn’t be flagged in NTHP’s system. Even valid, yet temporary email accounts such as those @mailinator.com might not be flagged in NTHP’s system. So with 8 hours left in the competition, Over-the-Rhine is away from first place by over a 1,300 votes. This deficit could be erased if an even more extraordinary effort than has already been seen on behalf of OTR happens today before 5pm. The Dreamland Ballroom’s middle of the night rise is suspicious to say the least unless they have a larger email list than The Breakers (Newport) or have done a better job at getting the word out than the Over-the-Rhine Foundation. OTR and Newport have had online stories appear on Cincinnati.com and Boston.com as well as local webmags like Soapbox Media (Cincinnati) and Go Local Prov (Providence) and The Newport Daily News ran this piece in support of The Breakers (PSNC) yesterday. I know support for OTR is all over facebook, twitter, and many local blogs (check here, here, here, etc) and even a TV news morning show. I can find no similar coverage of the Dreamland Ballroom’s campaign except one local TV broadcast story from June 4 and a couple posts on its facebook page. So OTR’s outcome, as always, is up to you. Getting your friends and co-workers and family to vote with every email address they have is of vital importance. Winning isn’t everything and I’ll reflect on the many positive aspects of the competition later, but until then let’s try to win this thing for OTR and all the buildings that should have been preserved here but weren’t. I usually schedule posts to publish themselves at 9:00am but today every hour counts so it will post at 6:00am. Please share this post and most importantly tell everyone you know to vote for the love of Over-the-Rhine and Cincinnati. ← The Hasty Demolition of 142 E. McMicken Ave.